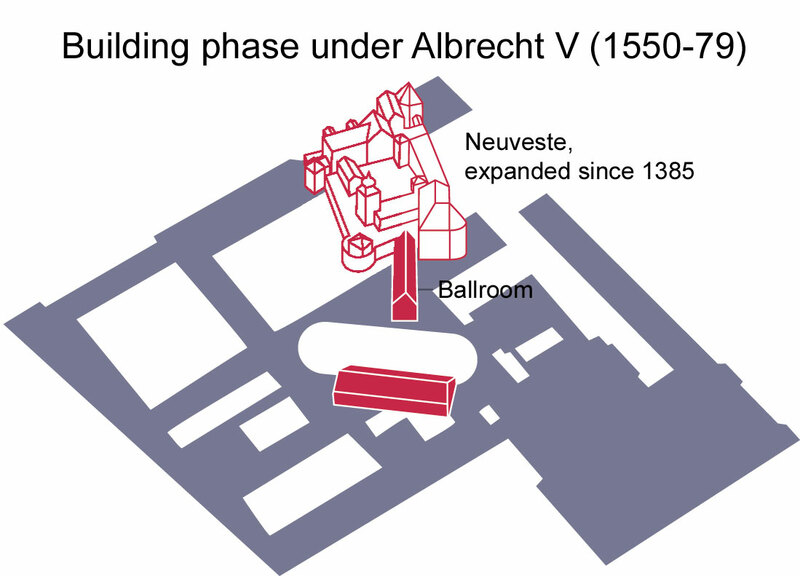 The castle built in 1385 in the north-eastern corner of the city as it was then, the so-called Neuveste, formed the original core of the present Residence. 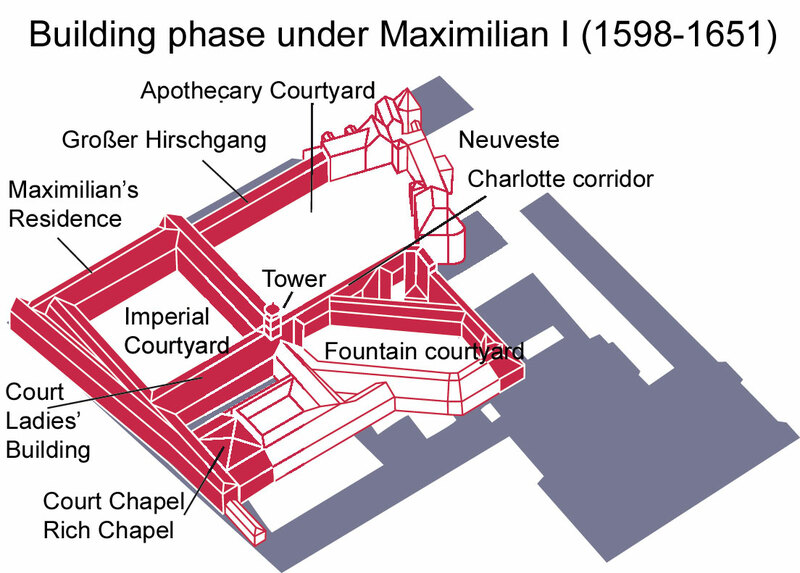 From here the rulers extended their palace to create a large complex grouped around several courtyards. The Antiquarium is more lavishly decorated between 1584 and 1600 under the direction of Friedrich Sustris. 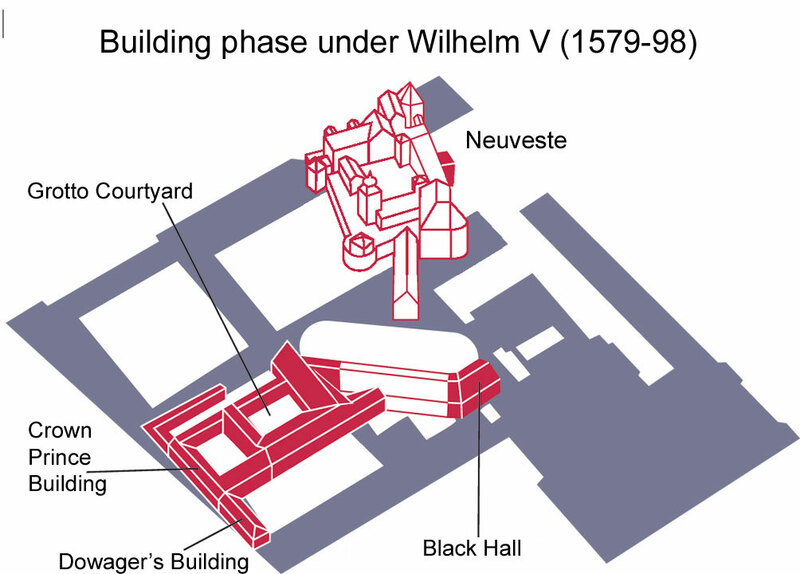 A new Court Garden is laid out north of the Residence from 1613. From 1730 to 1737 François Cuvilliés the Elder also builds and furnishes a new state apartment, the Rich Rooms, on the Grotto Courtyard, as well as the Green Gallery belonging to this suite, which is erected on the site of the former south Residence Garden. 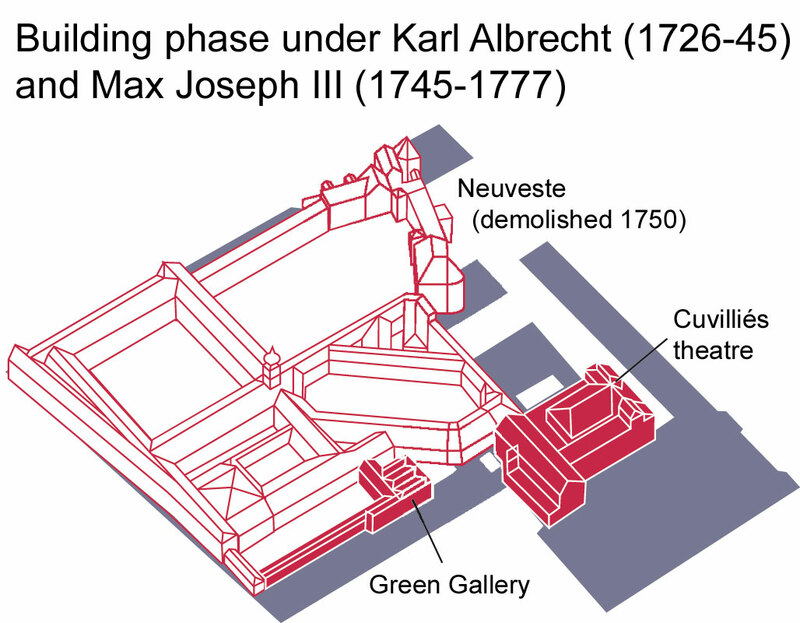 From 1789 the English Garden is laid out as a public garden by Friedrich Ludwig von Sckell. 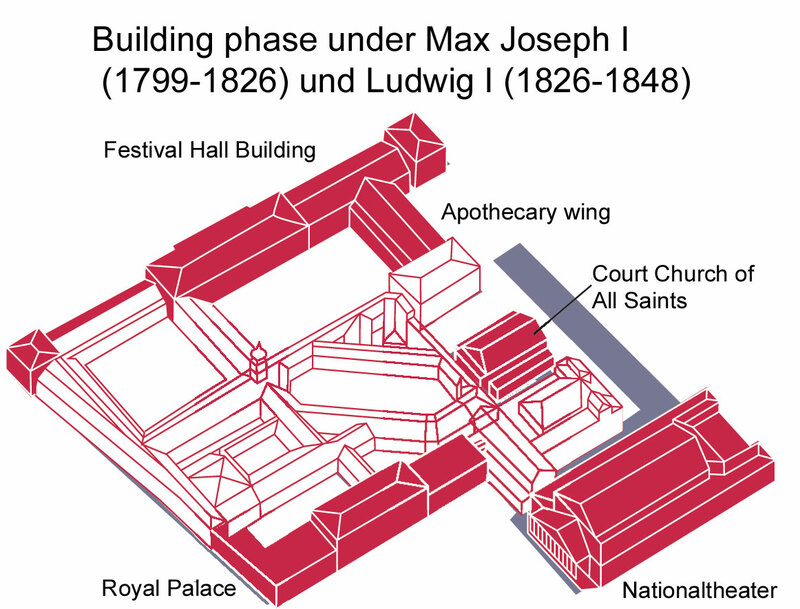 The Imperial and Four White Horses Halls are remodelled by Charles-Pierre Puille and Andreas Gärtner to create the Court Garden Rooms, 1799-1816. 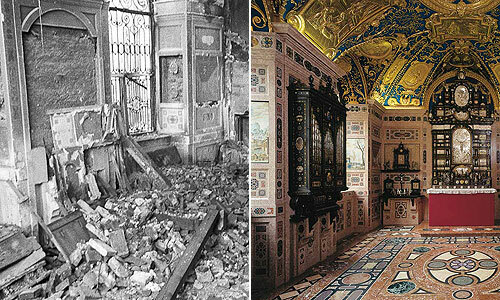 After the monarchy came to an end in 1918, the Residence lost its function as a seat of government and was turned into a museum of interior design, which opened its doors in 1920. 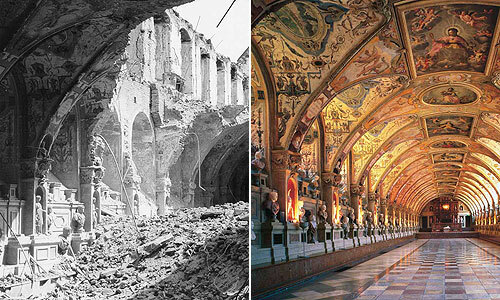 The Second World War had catastrophic consequences for the Residence: in March and April 1944 much of the upper storey and numerous vaulted ground-floor rooms were gutted. Most of the moveable inventory had however been taken out beforehand and stored in a safe place. A Residence building office was set up as early as May 1945 to prepare for the subsequent reconstruction of this building complex in view of its great historical and cultural value. 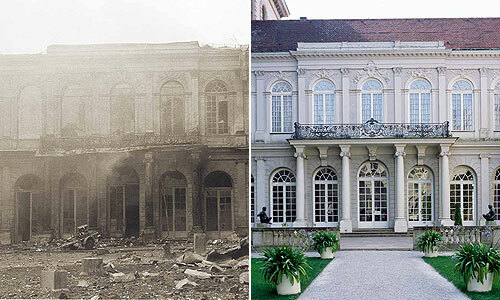 The reconstruction took several decades. 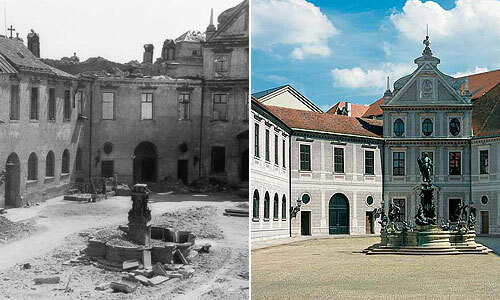 This was the responsibility of the Residence construction management, which was answerable to the Bavarian Department of State-owned Palaces, Gardens and Lakes, and worked closely with the Department’s art historians and the newly founded restoration workshops. 1953: Opening of the Hercules Hall as a concert hall in place of the Throne Room of Ludwig I in the former Festival Hall Building.